The Interactive Gartner Magic Quadrant® is Gartner‘s proven and established market and vendor evaluation methodology for more than 300 markets. Gartner Peer Insights is our platform for ratings and reviews of enterprise technology solutions by end-user professionals for end-user professionals. Interactive Magic Quadrant and Peer Insights we are bringing together our expert opinion and the Peer Insights user-contributed reviews into one experience via the Interactive Magic Quadrant. Only Gartner offers the full spectrum of expert research and advice and user ratings & reviews in one convenient location. Along with the new User Reviews tab, the Interactive Magic Quadrant continues to allow users to customize the evaluation criteria ratings to create a quadrant view unique to their goals and priorities. Count on Gartner for rigorous methodologies, processes and quality standards that deliver unbiased research and authentic peer reviews. 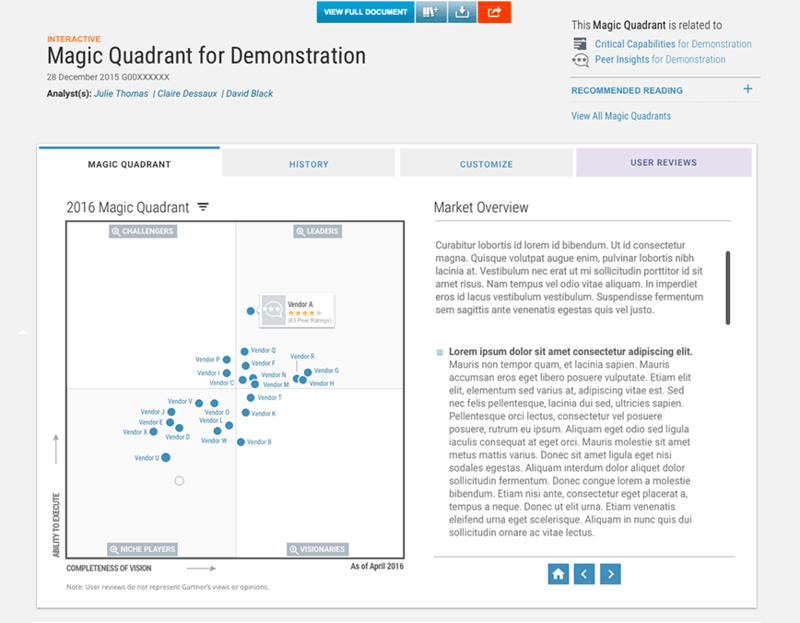 We welcome your feedback and comments at InteractiveMagicQuadrant@gartner.com.